· Fee can be paid on a Monthly Basis or Quarterly Basis. · Last date for payment of fees on Monthly Basis is 10th of each month and for Quarterly basis is 20th of the first month of each quarter i.e April, July, Oct, Jan.
· Monthly payment of fees will be received only through crossed cheque/DD between 08.30 hrs and 11.30 hrs on all working days only upto the 10th of each month. However, for February and March,2020 the fee will be paid latest by 10 Feb 2020. Post 10 Feb,2020 the fees will be accepted only by Pay Order. No cheque payments will be accepted. · All pending dues are to be cleared before the Result declaration and promotion to the next higher class. · Quarterly Fees can be paid through crossed cheque between 08.30 hrs and 11.30 hrs from 01st -20th of the first month of each Quarter on all working days. (*If unable to Login to Parent Portal using Child's OMV card number and the password provided, then, please contact the School via email – bbpsnd@hotmail.com). PTA fee is be payable during 1st Qtr only. · The name of the Student/ Class/Section/Adm.No. /Mobile No should be written on the back of the cheque. · Parents wanting to drop the cheque in the drop box placed inside the guard room may do so and collect the receipt at a later date personally or through their wards. Combined Cheque. Parents are to issue a combined cheque for School Fee and Bus Fee. Parents having more than one ward in the school are to issue a single cheque towards the payment of fees for all. Fee Defaulters. The school will receive the fees for all fee defaulters of the I,II or III Qtr (If paid after 10th of Third Month) through Pay Order only. , For the IV Qtr (If paid after 10 Feb 2020) fees will be accepted only by Pay Order. No cheque payment will be accepted. Class X & XII. Fees for IV Quarter will be accepted either via ONLINE PAYMENT/Pay Order. Parents of Class XII students are required to pay Bus Fees for 10 Months only. All pending dues are to be cleared before issuance of ADMIT CARD by the school. (Monthly payment facility will not be available for IV Qtr). · For Parents opting for Monthly Fee ‘Late fee fine @ Rs 20/- per day ‘ will commence from 11th of the month till the day the fee is paid. For Quarterly Fee a fine of Rs.20/- per day will be chargeable from 20th of the month in which the fees is to be paid till the day the fees is paid. · Cheques returned by the bank for any reason will be treated as non payment and fresh payment will be made through Bank Draft, together with a fine of Rs.500/- in addition to the fine towards late payment as mentioned above. If 10/20th of the Fee Payment month happens to be a Sunday or a Holiday, the fee should be paid before that day. Parents are to note that validity of a cheque is for 3 months and, therefore, sufficient fund must be ensured for the entire period of the validity of cheque. · Withdrawal from School / Bus Facility. for withdrawing a child for any reason, parents are to give one month’s notice or one-month’s fee in lieu. bus facility will be withdrawn if bus fee is not paid by 20th of the 1st month of a quarter. Facility once withdrawn will not be restored. A student who fails to deposit fee on time will not be allowed to use the bus facility from 21st day onwards if it happens to be a working day. however, cases of non payment due to extra ordinary circumstance may be considered for restoration not later than a maximum of 10 days as grace period and only after payment of outstanding dues together with fine and restoration charges of rs.100/-. NO POST DATED CHEQUE WILL BE ACCEPTED BY THE SCHOOL. Transfer Certificates : Application for TCs are to be made at least two weeks in advance. TCs will be issued only on clearance of all dues. Duplicate copies of TCs are not ordinarily issued. In exceptional cases a duplicate copy may be issued on production of an affidavit that the original TC has been irrecoverably lost. The responsibility for any possible misuse will rest on the parent. Parents wanting any kind of bonafide certificate from the school for their ward(s) or for Income Tax purposes may forward their request 3 days in advance, as to avoid any kind of delay. The student who gets admission on merit or through the School Admission Test and whose parental income from all sources is below Rs. 1,00,000/- (one lakh) per annum. Fee can be paid on a Monthly Basis or Quarterly Basis. Last date for the payment of fees on Monthly Basis is 10th of each month and Quarterly basis is 20th of the first month of each quarter i.e April, July, Oct, Jan. Monthly payment of fees will be received only through crossed cheques between 08.30 hrs and 11.30 hrs on all working days only upto 10th of each month. Quarterly Fees can be paid Online from 01-20th at the beginning of each Quarter or by crossed cheque between 08.30 hrs and 11.30 hrs on all working days. The name of the Student/ Class/Section/Adm.No. /Mobile No should be written on the back of the cheque. PTA Fee will be payable during 1st Qtr only. Parents wanting to drop the cheque in the drop box placed inside guardroom may do so and can collect the receipt at a later date or through their wards. Combined Cheque. Parents are to issue a combined cheque for School Fee and Bus Fee, if possible. Parents having more than one ward in the school are to issue a single cheque for payment of fee. Fee Defaulters. 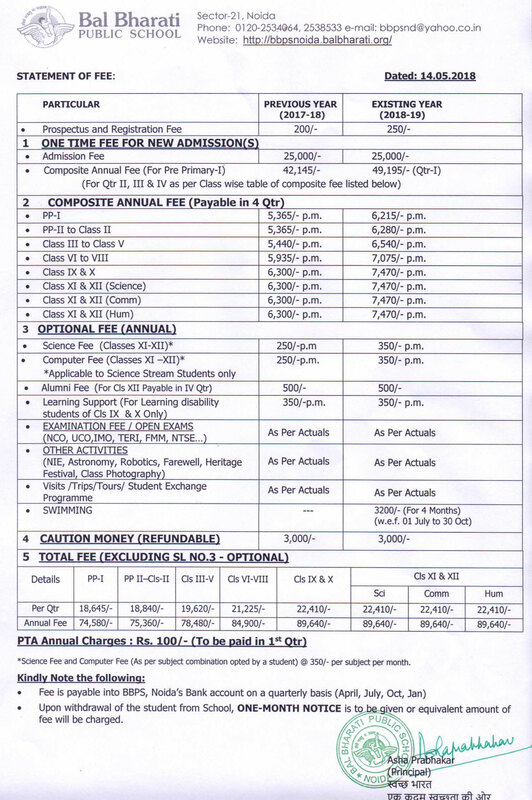 All fee defaulters for the IV Qtr are to pay fees only by Pay Order. If paid after 10 Feb 2019, No cheque payment will be accepted. Class X & XII. Fees for IV Quarter will be accepted either via ONLINE PAYMENT/Pay Order. Parents of Class XII students are required to pay Bus Fees for 10 Months only. All pending dues are to be cleared before issuance of ADMIT CARD by the school. For Parents opting for Monthly Fee ‘Late fee fine @ Rs 20/- per day’ will commence from 11th of the month till the day the fee is paid. For Quarterly Fee a fine of Rs.20/- per day will be chargeable from 20th of the month in which the fees is to be paid till the day the fees is paid. Cheques returned by the bank for any reason will be treated as non-payment and fresh payment will be made through Bank Draft, together with a fine of Rs.500/- in addition to the fine towards late payment as mentioned above. Withdrawal from Bus Facility. For withdrawing a child for any reason, parents are to give one month’s notice or one-month’s fee in lieu. Bus facility will be withdrawn if Bus Fee is not paid by 20th of the 1st month of a quarter. Facility once withdrawn will not be restored. A student who fails to deposit fee on time will not be allowed to use the Bus facility from 21st day onwards if it happens to be a working day. However, cases of non payment due to extra ordinary circumstance may be considered for restoration not later than a maximum of 10 days as grace period and only after payment of outstanding dues together with fine and restoration charges of Rs.100/-.